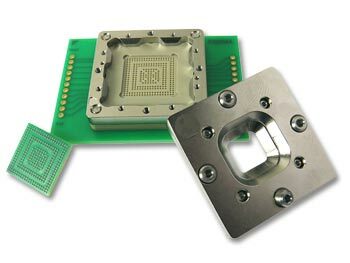 Ironwood Electronics recently introduced a new socket addressing high performance requirements for Burn-in and Test applications – SBT-BGA-6553. The contactor is a stamped spring pin with 31 gram actuation force per ball and cycle life of 125,000 insertions. The self inductance of the contactor is 0.88 nH, insertion loss of < 1 dB at 15.7 GHz and capacitance 0.097pF. The current capacity of each contactor is 4 amps at 80C temperature rise. Socket temperature range is -55C to +180C. Socket features a floating guide for precise ball to pin alignment. Socket also includes integrated compression plate that has a center opening for accessing device top surface. The specific configuration of the package to be tested in the SBT-BGA-6553 is BGA, 17x17mm body size, 0.8mm pitch and 20×20 ball array. To use, drop IC into the socket, place the lid, and apply down force using four screws alternatively. This socket can be used for hand test and quick turn custom burn-in applications with the most stringent requirements. Pricing for the SBT-BGA-6553 is $665 at qty 1 with reduced pricing available depending on quantity required. This entry was posted on Monday, October 15th, 2018 at 11:55 am	and is filed under Advertiser, News.